After a bit more of an interesting recent month, it’s back down to ‘normal’. I decided rather than plan anything inparticular recently, I would just go out and enjoy the day though I did hope on the two of the ocassions I did go out, that I might photograph some Roe Deer. Unlike my sucess with the Foxes, I spent some three hours searching for a sight of a Roe but nothing, just a few tracks. Large parts of the woodland were covered with a thick undergrowth, particularly ferns but still, I would have expected more. As I was giving up I walked passed what I thought was a ray of sunshine shinning off a tree stump but after a few steps further, thought it might be a deer so walked back a little. There in the distance was a Roe staring right at me. Their eyesight isn’t great, better at picking up on movement so I just stood still and waited, and waited, and waited and still it stared without flinching. It was a case of who was going to move first which luckily it did first. As it move off I thought I might be able to set up my camera at a location I thought it might pass by – a small clearing which, if I was correct, it would have to cross. So this is what I did and waited. After around 30 minutes I figured it must have gone in a different direction so got up and started to move away when I saw to my left barely five metres away, the Roe Deer followed by a little fawn. How I didn’t see it before or it me while I was just standing there, I don’t know, but all I could do was watch it pass. Any movement and it surely would see me and I didn’t want to scare it. Strike on photo opportunity. My second visit to the same woods proved equally futile and again I made my way back stopping at a clearing to enjoy the morning sun and the view. After about a minute I noticed a male Roe, again about five metres in front of me just starting at me. How did I not see it before and why did it not run off before? Had it been there all that time or had it walked into view before noticing me? It was another case of who could outstare the longest which again, I managed and it quietly walked into the undergrowth. It’s amazing how an animal the size of a Roe Deer can just blend into the surrondings. Admittedly, on both these occassions I had ‘turned off’ and lost concentration, having given up on seeing anything, but still! Another visit to the spot I photographed Foxes in early July, though the grass was even longer than before so when I did eventually see a Fox if was barely visable. I could hear alot of alarm calls from a Blackbird so I know it was around in the area, I just couldn’t see it. A few shots from woodland areas of Grey Squirrels, Pheasants and a Jay. Within the wetland areas I tried a fancy slow shutter speed shot of a Tern hovering. Unfortunately, it wouldn’t face towards me which would have help make the shot. The final image was a macro attempt. Strictly not macro though as it was taken with a 300mm lens and cropped. I do have a 105mm true macro lens but I find this type of photography a completely different challange from what I normally do. There’s no way I could have got close enough to this Dragonfly with a 105 lens. Even at over 2 metres distance with the 300mm, I had to patiently ‘stalk’ it and this was taken at close to the lenses minumum focusing distance. I think maybe why I’ve never really taken up this type of photography is because, to get the best results you need sunshine and low or zero winds, not at plentiful supply in this part of the world. On this occassion I didn’t have the latter and only some of the former. There’s often a story behind the taking of any photograph, especially with wildlife and on this occasion this was no different. Having tried on numerous occasions in the last six months to photograph Foxes, without luck, it was seemingly just another attempt. They can be surprisingly elusive, more typically nocturnal though at this time of year the cubs have been ‘kicked out’ of their home and so looking for their own territories. 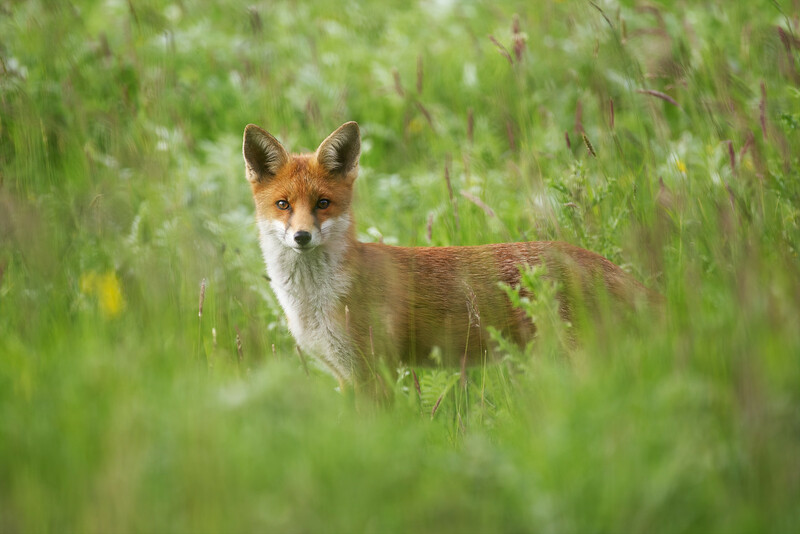 Luck was on my side this time as I spotted a reddish brown clump of fur in a sea of greenery. Already waist high in grass I just needed to cover my lens and top half with my trusty netting and settled for a wait, and wait I had to as after nearly 20 minutes of no movement I was starting to think the poor Fox may not be alive but a flicker of an ear proved otherwise. Another 10 minutes or so and it woke up had a scratch, a quick look around, another scratch then back for a snooze. 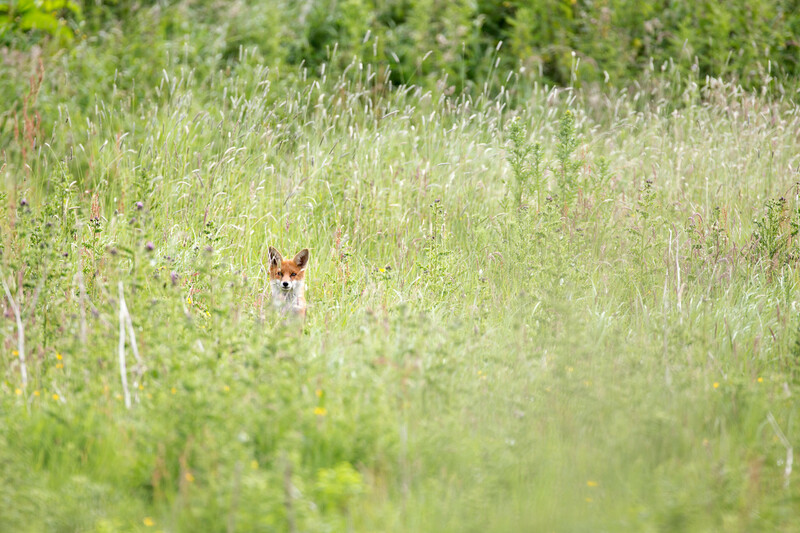 After I momentarily looked away then back the Fox, which had barely moved in 40 minutes, had got up and was disappearing into the long grass. I thought that was probably the last I would see of it – there would be no point in trying to follow it, but was just the slim chance I could work my way around the direction it was taking where I could move quickly without being noticed, and maybe catch up with it further along. I found a spot with a clearing and barely had time to set my camera up and haul my scrim netting over when it came right into the spot I had hoped it would. I would like to say this was skill on my behalf but wildlife photograph and watching is made up largely of luck. The Fox could have gone in any direction including doubling back or in the thick undergrowth, I could have just as easily not seen it, but here it was and not only that but in that one spot it then proceeded to take another nap! The differences in the look of the images was due to the continuing change between dull and cloudy one minute to bright sunshine the next. Due to the long grass obscuring a clear view, focusing had to be done manually. Despite this many of the images came out a bit fuzzy although on a couple of shots it worked in my favour by giving the image a centre of focus. I had my camera set to ‘silent’ mode, though not completely silent it was enough not to disturb the Fox which slumbered but for the occasional stretch, yawn or glance around especially when a couple of Magpies made a noise presumably due to the this predator being in the area. After over half an hour, being in some discomfort having not have time to ‘set up’, a combination of cramp and flies, I decided to quietly move away, leaving the still sleeping Fox none the wiser I was even there. Moving slowly away with my netting now off, to my left in plane sight, was another Fox just staring at me. With the very narrow sight of view I had under my netting and just seeing through the camera’s viewfinder, I hadn’t seen this one. I don’t know if it had just came into sight as I moved away or if it had always been there but I barely got off a few shots knowing I had been well and truly spotted, before it was quickly off. I’m guessing this second Fox explains why the Magpies were making so much noise earlier. I figured the other Fox, probably a sibling, would now also be alerted to my presence and be off but it was still asleep. With legs now stretched I decided to stay another few minutes which was all it was before this other one woke up and started to have a look about, where it spotted something in the grass and before I knew it, had pounced and swallowed whatever it was, whole. It then vanished into the long grass. As I left the way I had came, a final look back and noticed one of the Foxes watching me leave. I thought it made a nice composition peering at me in a sea of grass. I finally managed to look through the remainder of the photographs took at my recent visit the the Farne Islands. I’m a little disappointed that there wasn’t that ‘special’ image amongst them, a few nearlys had it not been for misfocus or cut off parts of the bird, but that’s photography for you. Last year I took a 500mm lens to see what, if any, difference that would make. Turns out I found it a disadvantage over previous years taking the 400mm. The most obvious reason being the birds are all around you – feet away, the 400mm lens seems the best option all round. The other not so obvious is the more limited field of view. It’s hard keeping a fast flying Puffin within the viewfinder. Then of course there is the portability, it’s much more convenient hand holding a lens which you can easily swing around. On the day there were people with everything from camera phones to 500mm lens to even a cine camera! Like the Turns, the Puffins nested right up to the boardwalks (or at least their burrows were). Surprising everybody I saw were standing up when taking pictures. By kneeling down I was able to get a few more interment shots at eye level. Perhaps the only reason why you might want to take a long lens were for those birds further out on the cliff edges, though I was till able to take some images at 400mm, no cropping. The best way I found to photographing a Puffin in flight was to look for one in the distance, follow it in the viewfinder whilst focusing on it, then when it got close enough, take the picture – or in my case I let the camera shoot at its full 10 fps. You can see in the image below that the sky could be crowded with birds often over lapping the bird I was following so I set the tracking focusing sensitivity to partially slow. Despite being reasonably bright to start off I used ISO 400 or 800 and for those birds in flight the smallest aperture I could with a shutter speed over 1/1000. Unfortunately my camera doesn’t support true auto ISO as this would have helped due to the sudden drop in shutter speed once the birds landed against the darker background. Strangely this year, the Puffins were flying in from the opposite direction with their catch, than with previous years hence few opportunities to photograph them with Sand eel as I'd done on previous occasions. I’m guessing this was down to the stronger winds and direction? One of these years I will take out the tour option where you can the best part of the day visiting the different islands and can spend more time on each. The single trip works out as barely 45 minutes photographing time so the tendency is to just take as many photos as possible in the time rather than just sit back watch what’s happening and taking a bit more effort with the photography, maybe spend some time just trying to catch a Puffin flying into its burrow, avoiding the Gulls. Well, it’s that time of year again when it’s time to pay a visit to the Farne Islands. I often take a week or two off work around the busiest time on the islands, when the various chicks are needing regular feeding and, too much later, will have fledged. As always the weather played a determined part in my going, with Monday looking ok’ish, Tuesday and Wednesday rain forecasted and Thursday, Friday…well the forecasters are hopeless and predicting a reliable weather report that far ahead, so didn’t want to risk waiting. Monday it was. The whole Farne Islands experience starts with the boat trip around the islands where they stop right up to the cliffs where there is an assortment of nesting birds including Puffins, Shags, Kittiwakes and Guillemots. There was even a sight of a Gannet. As well as the birds on the cliffs, you’re taken around the seal colony. They seemed quite un phased and indifferent by it all, these tourists packed inside a boat gawking at them, despite again, getting close up. Finally comes the landing on Inner Farne, just one of the islands that makes up the Farnes. Everybody’s pre warned and ready for what comes next! Head protection on, as it’s the gauntlet of Terns once you’re off the boat and walk up the board walk, past the Tern nests. Each year, despite the thousands of visitors, the Terns still nest in the same place, often a few feet away from where people pass. I suppose the official reason for the attacks is that they are protecting their nests, but watching I can’t help but wonder if they don’t do it because they enjoy it. I stopped to take one photo of the below Tern who just starred at me with a grumpy look, otherwise I did what I do every year which is walk past, wide angle lens on my camera which is set to the fastest frames per second possible, point up and walk! Most shots are out of focus or out of frame but the occasional one is just about right. It’s not so much the pecking I’m concerned about but what the other end of the bird can do and looking at the jackets of the helpers on the island who are there daily, it’s probably wise not to hang around. Besides you have less than an hour on the island which may seem a while but that time soon goes. The main part of the trip, at least from a photographic point of view are the Puffins and there is not short supply of them. The boardwalks continue around the island and through the vegetation where the Puffin burrows are where the chicks are in the nests. For anyone who has never been to the islands the sight and sound is amazing. Much like the Terns, the Puffins are also nesting right past where you walk, though unlike the Terns the Puffins have a bit more of a easy going nature – maybe too much so as they have to pass the gauntlet that are the gulls, intent of robbing them of their Sand eel catch. They fly in and are immediately accosted by the gulls often five or more and have to scramble into their burrows. Little chance then of the classic photograph of a Puffin with a beak full of the eels then. Having not even looked at a third of the images taken on the day, I’ve decided to break this down into two different blogs with the second part coming after I’ve had a chance to look at the remaining photographs I took on the day. Hopefully there might be a few ‘special’ ones.